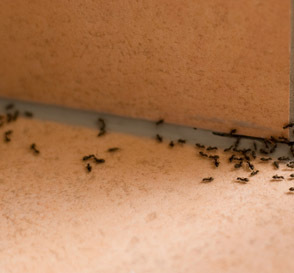 Ants are one of the most common pests in and around homes in Williamson County. Now that the weather is getting warmer, ants that seemed to have disappeared into thin air during the winter, are suddenly back again, and perhaps even marching across your kitchen counter. Ants can hibernate during cold weather, which is why you don’t see them sometimes in the winter. The warm weather elevates the hibernating ants’ body temperature, and it lulls them out of their dormancy to search for food. If ants have already started visiting you in Brentwood, Franklin, Spring Hill, and greater Nashville give us a call at Bug Authority to get your ant problems resolved quickly. Thinking of doing it yourself? There are all types of home remedies and over-the-counter sprays for getting rid of nuisance ants, but most of these methods result in nothing but expense, work, and frustration for the homeowners. Spraying pesticides inside your home without the knowledge of the proper chemical to use or the proper application methods can even be hazardous to your health. At My Bug Authority, our ant pest control professionals have the training and experience to deal with household ant problems and eliminate them at the source. Identifying the species of ant helps professionals determine the nesting site, food preference, and the best course of action to eliminate them. In most cases, the most effective and permanent method of eradication is to find and treat the nest. The queens must be killed to properly eliminate an ant colony. The DIY method of spraying ants directly or spraying their trails is only a temporary solution because it has no impact on the nest. Different ant species have different nesting habits and food preferences. It can be very difficult for non-professionals to find ant nests. Ants that nest in the home build their nests behind moldings, baseboards, countertops, and similar places. Some species nest in decaying or moisture damaged wood. Ants feed on different types of food, including starches, meats, fats, and sweets. Our knowledge of ant food and nesting preferences helps us eliminate ant colonies in your home. So instead of tackling this problem yourself, give us a call at Bug Authority.